Ottoman by Coaster Furniture. Use in your living room, family room or other areas for a comfortable touch. 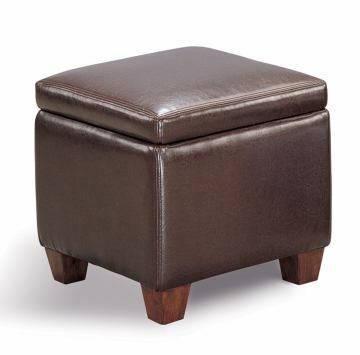 The cube shaped ottoman is covered in a faux leather fabric featuring clean lines in a dark brown to complement your decor. The plush top lifts off to reveal enclosed storage which is perfect for keeping clutter out of sight. Use alone or beneath a coffee table for a unique style with great function.